EDMONTON, CANADA--(Marketwire - August 27, 2010) - The Edmonton Marriott at River Cree Resort has taken a number of important measures to reduce the resort's environmental impact. This West Edmonton hotel has environmental awareness programs and committees in place that involve management, employees, guests and the public. The hotel has received a 3 Green Key rating through the Hotel Association of Canada's (HAC) Green Key Eco-Rating Program. "We are very proud of the resort's numerous environmental initiatives," says Matt Knights, General Manager of the Edmonton Marriott at River Cree Resort. "Our guests and associates are committed to following best practices and green initiatives to protect the environment for generations to come." At Edmonton Marriott at River Cree Resort, discover one of the newest West Edmonton hotels, boasting a vibrant, resort-style atmosphere and renowned Marriott service. Ideal for business or leisure travel, this four-star hotel in West Edmonton is set on a 49-acre estate, just five minutes from the renowned shopping mecca of West Edmonton Mall. Engage in highly unexpected forms of onsite recreation -- from two NHL-sized hockey rinks to a lively casino, with over 950+ slot machines and 50 table games and great access for those interested in Edmonton golf getaways. We truly set the standard for hotels in West Edmonton, providing elegant rooms and suites featuring plush bedding, large windows and breathtaking views of downtown and the surrounding countryside. Savor the chic ambience of this River Cree / Edmonton hotel -- featuring three restaurants, a centre bar and a Starbucks café. For meeting guests, we offer a choice of 21 magnificent venues with world-class service from professional Edmonton event planners. Discover why the brand-new Edmonton Marriott at River Cree Resort is a leader in Edmonton lodging. 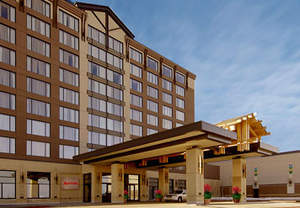 The four-star Edmonton Marriott at River Cree Resort is set on a 49-acre estate, only five minutes from the world-famous West Edmonton Mall. A perfect choice for both business and leisure travel.